Each December I am caught up by the kind of energy that prevails as academic semesters end: the euphoric sense that final exams will soon be taken then suddenly I will be floating on an expanse of free time called “winter break.” My plans for this winter break included finishing a script, installing and learning a budgeting program, cleaning the house, watching every movie missed over the course of the year, and writing a year-end letter for family and friends. It is usually a day or so after Christmas that it dawns on me—as if I didn’t have the same realization the year before—that my actual vacation time is five days, two of which are filled with holiday activities, and that I have yet again overestimated the amount that can be achieved in that time. If 2012 was a roller coaster, then 2013 was…not. In 2012 the Elantra got totaled, in 2013 the Camry slowly and undramatically diminished in capacity until it was sold on Craigslist. 2012 contained a bout with cancer. 2013 brought merely a benign trickle of late billing and insurance paperwork. In 2012 Paul’s first feature, Rock Jocks debuted. In 2013 it ran its small theatrical run, showed up on iTunes, then Netflix with little fanfare. My part-time job at USC continued. My script “in development” is still in development. 2013 might be seen as anticlimactic, as a profound relief, or both. It depends on how you feel about that coming to that slow glide at the end of a ride, finally stopping being released from behind the metal safety bar that never feels that safe. Another thing experience has taught me is that at an amusement park, it’s the time on the ground that ultimately sets the tone for the day—the time hanging out and talking to friends, people watching, taking silly pictures and deciding which snakelike line to stand in next, half anticipating, half dreading that next climb up a daunting-size hill strapped onto a piece of plastic that will hurtle through space at high speeds. My final judgment is that 2013 was an awesome year. I went camping for the first time in a decade (to the Grand Canyon) and went to my high school reunion back in Indiana. Paul and I visited friends in Denver, and more friends and family in New York. We ate Sunday dinners with family and witnessed our niece and nephew growing bigger and more entertaining by the day. And there was writing–on trips, on the train commuting to work, during lunch breaks and in bed in the mornings and even once in a while at my desk in my office. Creatively, it was a year for a few small projects completed and some bigger ones continuing and started, for meeting people and entering into new working relationships that I am excited to see continue in this year ahead. Ultimately, it was a year of taking notice and taking breaths, for profound moments of gratitude shaken awake by people, landscapes, food, books, movies, rain, sun, electric blankets, holiday cards—and sometimes by nothing at all. 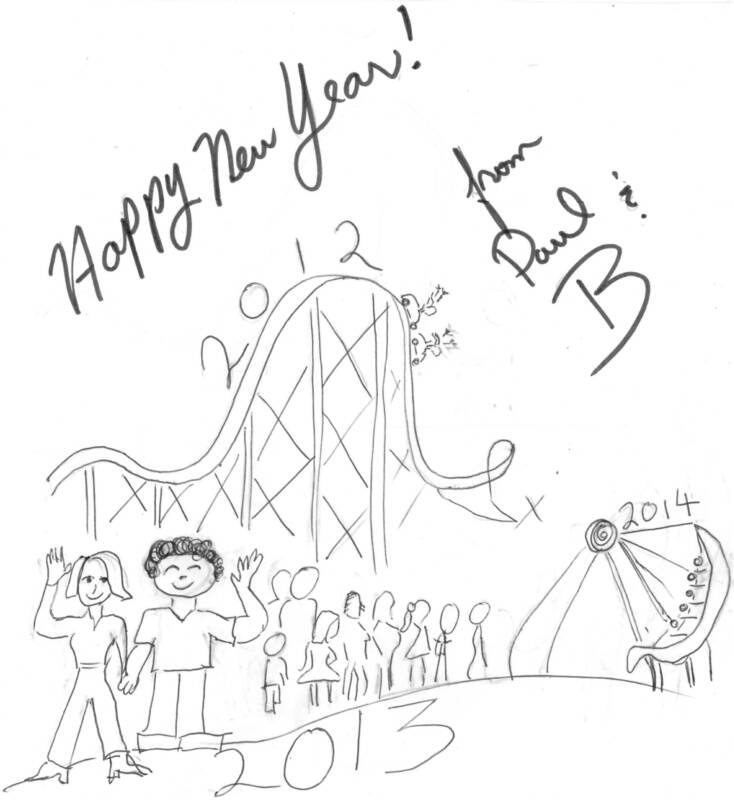 Paul and I wish you all the best for the upcoming year.